Maybe it’s the 50-degree weather we had last week (I saw a patch of grass, you guys! GLORIOUS DAY). Maybe it’s because I had my baby shower this weekend and my family and friends and I all got to ogle over baby dresses together. Maybe it’s this playlist I’m listening to on repeat lately. Or maybe it’s this lemony, garlicky, buttery salmon I recently had for dinner. I don’t know. But things are definitely looking up. Much as I love me some seafood, I really don’t cook much of it at home besides shrimp (and usually I buy the pre-cooked kind, so it’s kind of cheating). I’m not sure why — I mean, we don’t eat a ton of meat anyway, so I suppose when we do decide that today is the Day We Will Eat Meat, we usually go for chicken or, more deliciously, bacon. But this dish alone may change my ways because lemon-garlic butter. I’m serious. This stuff is a game changer. It takes literally three ingredients and two minutes to prepare, and yet it makes almost anything taste like heaven on a plate. I’m considering making a bulk jar of it and just pouring it on everything — pasta, salads, hamburgers, a spoon that goes straight to my mouth. You get the idea. It’s so g-o-o-d.
You know what else is good? 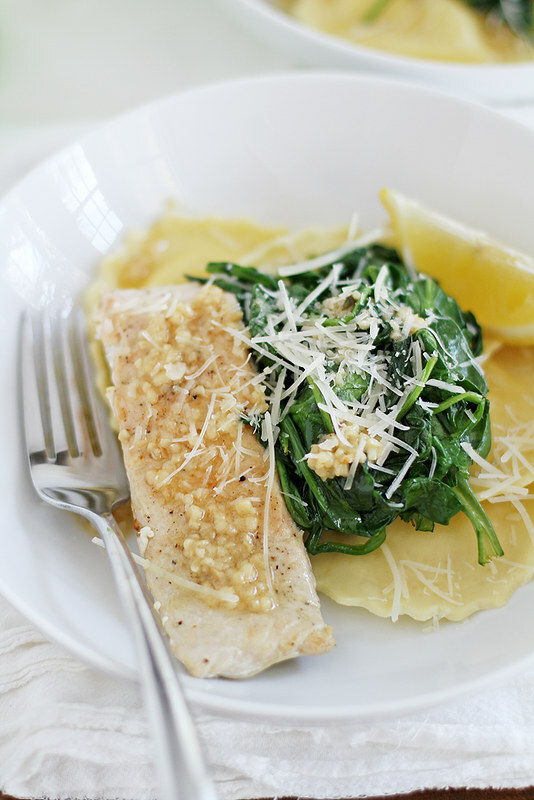 Salmon with cheese ravioli. I don’t know why this is such a revelation to me, but it is and I am enlightened. Add in some wilted greens and of course, the lemon-garlic butter, and I’m pretty sure you already know where I’m going with this but YUM times infinity is the best way to describe it. Let’s just put it this way: When the husband and I had it for dinner (at 6:30, and the sun was still shining! ), all that was leftover was one salmon filet — which I promptly ate for lunch the next day. On a salad. With a gallon of lemon-garlic butter poured on top (just kidding. But I wish). Now here comes my horrible segue into how this ties into St. Patrick’s Day: Um, it doesn’t. But I think you should make it for dinner tonight anyway. Maybe pour on extra lemon-garlic butter, for the luck. Bring a large pot of water to a boil. Cook ravioli according to package directions. Drain. Meanwhile, cut a lemon in half lengthwise. Squeeze juice from one half into a small bowl. Slice remaining half into wedges. Heat a large skillet over medium heat. Add oil. Pat salmon dry, then sprinkle both sides with salt and pepper. Place salmon in skillet. Cook 6 to 8 minutes, turning halfway through, until salmon flakes and is cooked through (an instant-read thermometer inserted in the thickest part of each filet should read 145 degrees F). Transfer salmon to a plate. Add spinach leaves to skillet. Cook until just wilted. Transfer spinach to a plate or bowl. Add lemon juice, garlic and butter to skillet. Stir until butter melts, then cook 1 minute more. Remove skillet from heat. 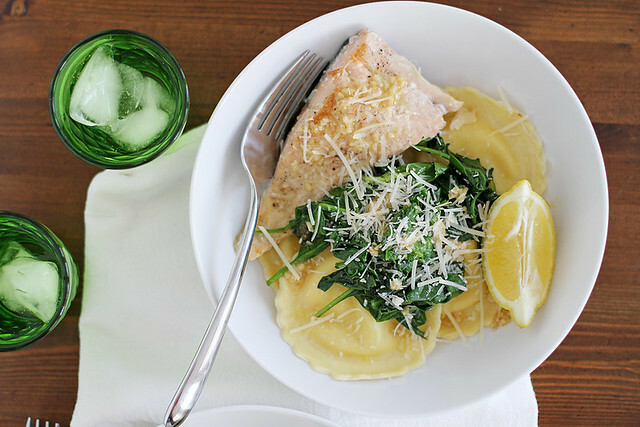 Divide ravioli among serving plates, then top with spinach and a salmon filet. Top with pan juices and shredded Parmesan cheese. Serve with lemon wedges. I’ve never seen white king salmon before. Is it a white salmon that you need to by special or just a farmed salmon? Thx. Oh man this is perfect for a weeknight meal. I love ravioli and salmon. Meagan — Thanks! It’s a new favorite combo. This looks so delish! My husband loves salmon and I could have sworn we have tried every possibility. Guess Not! White Salmon here we come…thanks for sharing! This looks utterly fabulous! Love the lemon garlic butter with the pasta. Pinned. I an going to need to make pasta more often now the weather is cooling down the flavor combo is delicious! Perfect meal for any night!! I love salmon!! Love these flavors.. and ravioli is a big winner in my house.. Such a gorgeous meal! And, I always love salmon! Lemon garlic butter is the best! The perfect topping for so many foods! This meal needs to make an appearance at my house soon! What a beauty! Hope you had a great baby shower… LOVE the name!!! You are combining my three favorite ingredients; lemon, garlic, and cheese!!!! I don’t eat salmon enough! I think when I was pregnant I had kind of an aversion to it. Time to get back on the fish wagon. Oh and missy, the next time we are together we have to chat music!! Love your playlist! I’m seriously in love. Sigh. Gretchen — Love that resolution! I hope you (all :)) like the recipe! Belinda — Pasta is the best comfort food (especially with cheese :)). Graham — Thanks so much! I’m not usually a fish fan (or any seafood) but this looks absolutely delicious! I may just have to try it out. Ilona — It’s a new fave combo for me, for sure! Gorgeous, love ravioli and the lemon-garlic butter! Totally on team salmon! And the ravioli? Forget.about.it. I love making salmon, but I never experiment with different flavors. This looks like such a great recipe. Thanks for sharing! So glad you had a great baby shower! Ummmm yeah…that lemon garlic butter needs to go on all the things. Eeeep – how was the baby shower?! Me want details on those dresses 😉 I bet they’re so friggin cute! Now. This recipe! Omg. So simple yet fancy! And I love how bright the flavors are. I need it. This is really the perfect weeknight dinner or a little romantic night dinner. I have never had salmon with ravioli but now you make me feel like I have been missing out on life. I will have to fix that immediately!! Lauren — Hooray for team salmon! Rachel — I need to experiment with it more, too, because it’s just so tasty. Zainab — It’s perfect for a date night meal that you don’t want to slave over (which, I think, is basically all of them ;)). 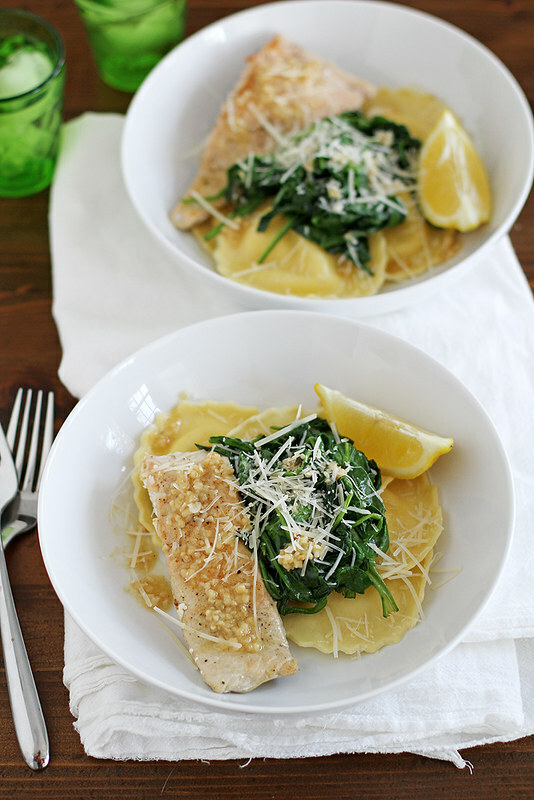 You’ll love the salmon/ravioli combo! I’m the same way with seafood! It’s my fave category of cuisine (besides chocolate and cheese, naturally), but I don’t treat myself to it enough. Now that you are combining seafood AND cheese, I have no choice but to splurge! I love garlic lemon butter. It’s hard not to go overboard when a sauce tastes that good. Love this dish. Pinned! Jennie — I just lose all control when I’m around garlic lemon butter. Too good. Thanks for pinning! IIIIII LOVE this! I’m always down for a hunk of salmon and the seafood ravioli is my fave! Our local grocery store has a pretty snazzy lobster rav that I’m just tickled pink over. Must make this whole meal pronto! Lemon-Garlic butter….can I just drink it?! Goodness this dish sounds so delish. Will make on Friday for Lent. Perfect date night meal! Kelly — Thank you so much, dear! This dish looks delicious! I LOVE the flavor combo of lemon/garlic/butter and don’t know why I don’t have it minimum once a day lol! Can’t wait to try this out for dinner soon. Stephanie — I wish I’d known about it sooner — I’d have eaten a lot more salmon! I love me some salmon , and I love me some ravioli. I don’t eat salmon nearly as much as I should (translation: I eat it never) but this looks like it could easily become a new weeknight staple at my house! I’m sure my family won’t complain about the new protein when it’s slathered in lemon garlic butter. WOW. So simple and perfect! The best flavor trifecta = lemon, garlic and butter. LOVE! We definitely don’t cook fish as much as we should, either! This meal could get me into good habits, though… It looks so darn scrumptious, Steph! PS, aren’t baby girl dresses to die for?! Don’t ever step into Janie & Jack unless you have an extra $5000 to part with… just warning ya. I’m so jealous of your green patch spotting! I fear that won’t happen here until June. At the earliest. I also have never thought to pair ANY fish with ravioli! Definitely a revelation. Joanne — Well it snowed a few inches here yesterday so it might be June before we see it again. This looks so elegent and fresh! Yum! Oh my word! This looks as divine as I am sure it tastes! Just made this!! So simple and delicious! I love that there are only a few ingredients all of which I had on hand! Thank you for sharing! Megan — Yes! So glad you liked it!